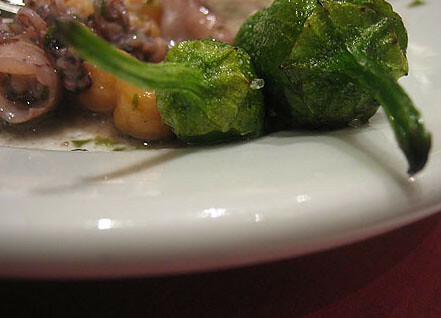 Our best dining experience in Barcelona? Hands-down, it was at Cal Pep. 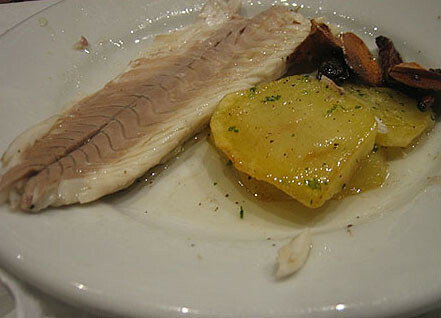 I read about Chef Pep and how he still cooks at the bar and entertains guests with his cigarette-smoke voice as if he’s known them for years, but no one seemed to know where Plaza de les Olles was until a local overheard us ask a boqueria waiter for directions. The waiter didn’t know either so the local took a napkin and sketched out a street map for us. 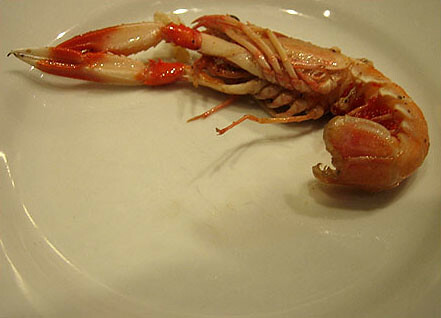 He was curious as to how we heard about Cal Pep because he told us it’s one of Barcelona’s foodie secrets. (Maybe that’s why no one wanted to tell us where it was!) This got us even more excited and a 40-minute waiting time spent standing behind the bar stools (with champagne, natch) didn’t seem to be an inconvenience. When we were finally seated, we noticed that the printed placemats matched the art hanging on the walls. They are sketches from different artists and they randomly give a different one to each customer. The more you make a mess, the more you get it replaced. So we sat at the bar elbow-to-elbow with everyone else–there is a dining room in the back but the action happens at the counter–and let one of the bartenders serve whatever he wanted us to eat (omakase, Catalan style!) 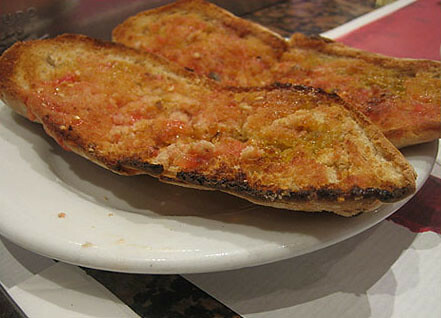 while we started with the traditional toast rubbed with grilled tomato and garlic. The next three hours were pretty much heavenly. Everything was made with passion and you could watch the chefs toss, sautÃ©, grill and fry different ingredients with gusto. 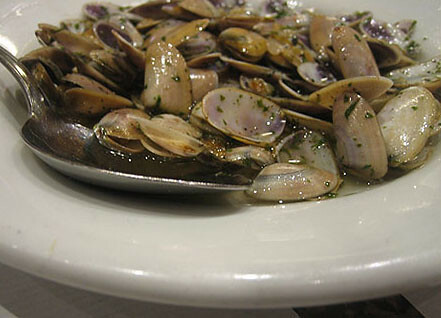 Almejas, or clams, were quickly fried in olive oil and parsley. They were so fresh, you really didn’t need much with them. The purple taint inside was so nice to look at, too. 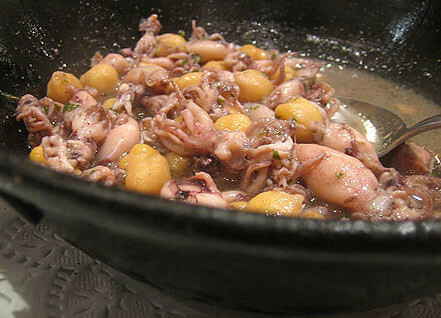 The chipirones, or baby squid, were the size of my thumb and cooked with garbanzos. This dish changed my distaste for chickpeas. The langoustines came next and we spent so much time peeling, eating the meat and sucking the juice out of their heads. They were a lot of work but every minute was worth it because the Dr. was so pleased. A German father and son next to us saw how well we ate, the father put some of his roasted pimento peppers on our plates to try. We ended up swapping stories throughout our meal. We could have ended our night there but we really wanted to taste the way Cal Pep cooks fish. It was almost 1am and they’ve ran out of monkfish so they served us seabass instead. The bartender showed us a fresh piece of fish and asked for our approval before cooking it. Before serving it to us, he filleted it for us. And it was at Cal Pep where we ended our vacation in Barcelona. We were full, drunk and happy as we stumbled back to our room in Hostal Goya room. After seven days of rigorous hiking, Barcelona meant to be our reward. It was just that. Great pics, did you take them at Cal Pep? I’m glad you enjoyed your stay, it’s a great place to live. Absolutely the best tapas in Barcelona!